The dots are beginning to connect to the Aztlan plan and the CALEXIT movement. At the heart of it is George Soros. However, many prominent members of the former Obama administration are participating as well as California’s past and present governors. The goal is to remove California from the United States and collapse the economy. And they will do so by any means possible. According to Paul Preston, reports are coming in that numerous state legislators from California, including “California Senate pro tem Kevin De Leon, State representatives from Florida, Texas, New Mexico, Arizona, Nevada, Utah and Colorado have been meeting with members of La Raza, the Mexican government (consulate), Mexican Mafia (La California’s violent Mexican gang Nortenos/Surenos/ Sur 13, La Familia and leaders of the Catholic/Jesuits church. They all have come up with a plan to separate California from the US. Former Governor Brown, his aides, and present Governor Newsome as well as the Bank of China have been in attendance in several of these meetings designed to sever California from the US. Further, The Common Sense Show has learned, independent of Paul Preston, that George Soros is bankrolling some of the costs associated with this movement. Former AG, Eric Holder, is the spokesperson. As Paul Preston has covered, Chapman University is spearheading the political goals of La Raza. La Raza is spearheading the participation of the dangerous cartel groups. And when one brings in the cartels, the terrorists (eg ISIS) are not far behind. There has been a decided effort to return the previously ill-gotten land and our top governmental officials think that this is a good idea/ One has to look no further than former Senate bill S. 744, sponsored by the late John McCain at the behest of former President Obama, to realize that the passage of this bill would have meant the end of a sovereign America. Perhaps America’s greatest domestic strength lies in taking in immigrants and assimilating them into our country as Americans. However, there are two groups who have repeatedly called for the seizure of several states and make them into an independent country, and these two groups are La Raza and MEChA. The concept of Aztlan has been sanctioned by the UN. The UN is also supporting the CALEXIT movement which is the withdrawal of California from the Union. This is the same UN that is transporting military grade vehicles within the United States. These groups have historically taught that Colorado, California, Arizona, Texas, Utah, New Mexico, Oregon and parts of Washington State make up an area known as “Aztlan”, a fictional ancestral homeland of the Aztecs before Europeans arrived in North America. MEChA’s founding principles are contained in these words in “El Plan Espiritual de Aztlan” (The Spiritual Plan for Aztlan): “In the spirit of a new people that is conscious not only of its proud historical heritage but also of the brutal gringo invasion of our territories, we, the Chicano inhabitants and civilizers of the northern land of Aztlan from whence came our forefathers, reclaiming the land of their birth and consecrating the determination of our people of the sun, declare that the call of our blood is our power, our responsibility, and our inevitable destiny. … Aztlan belongs to those who plant the seeds, water the fields, and gather the crops and not to the foreign Europeans. … We are a bronze people with a bronze culture. Before the world, before all of North America, before all our brothers in the bronze continent, we are a nation, we are a union of free pueblos, we are Aztlan. For La Raza todo. Fuera de La Raza nada. Chicano is our identity; it defines who we are as people. It rejects the notion that we…should assimilate into the Anglo-American melting pot…Aztlan was the legendary homeland of the Aztecas … It became synonymous with the vast territories of the Southwest, brutally stolen from a Mexican people marginalized and betrayed by the hostile custodians of the Manifest Destiny.” (Statement on University of Oregon MEChA Website, Jan. 3, 2006). Miguel Perez of the Cal State-Northridge’s MEChA chapter stated: “The ultimate ideology is the liberation of Aztlan. Communism would be closest. Today, Chapman University has picked up the torch and is leading the way in this movement. And at the heart of this movement is the Sinoloa Drug Cartel, controlled by the Chinese army, which is now in control of the Emerald Triangle in California. In addition to what Paul Preston revealed as to the brains behind the Calexit movement, he revealed that he has a man on the inside, let’s call him “Mike”, as Paul Preston calls him. “Mike” not only reported on the attendees of these Calexit meetings, this insider reports CONFIRMED the former Obama administration has had three members in attendance and the administration is in support of this movement. Again, this point cannot emphasized too strongly. Need I point out that this man’s life would be in grave danger if it were discovered that he was a plant and reporting to the Independent Media?Therefore, his identity will never be released. At the time I interviewed Paul, he was gravely concerned for the fate of the insider. At the time that this interview was conducted, “MIike” as Preston calls him. was two days overdue for his check-in. Please review the list of participants and you will quickly realize Preston is concerned about the safety of “Mike”. The La Raza movement seems to be at the core of this movement. However, the original movement has morphed in its scope and implementation. As revealed in their meetings, if CALEXIT is unsuccessful and the Deep State movement is backed into a corner, extreme mass violence against whites and black street gangs will be initiated. We are beginning to link the Vegas massacre to this movement as revealed by “Mike”. The Vegas incident is becoming increasingly viewed as a beta test for the fail safe, mass-murdering plan of the CALEXIT movement. And the Mexican cartels are lying in wait to fulfill their Reconquista plan. The Chinese will have access to California’s agriculture and water on a larger scale, the UN will succeed in wreaking economic havoc to America’s retail traffic and agricultural supplies by neutralizing California. This is an ongoing plot as we are discovering many pieces of this puzzle as we go. 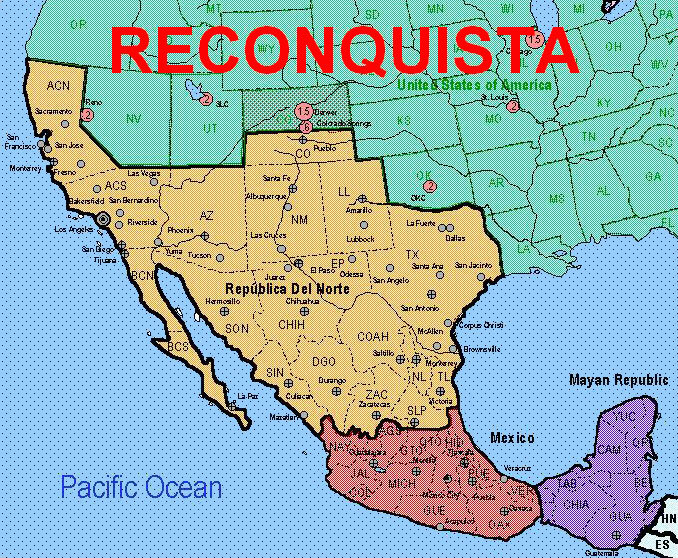 One thing can be said with certainty, if the Reconquista de Aztlan plan is successful, there will be no whites or blacks living in an 8 state region in the west. If you think something big is coming in the face of recent Trump victories, this is your number one candidate.